The window below will open. 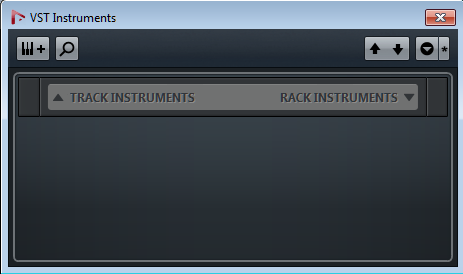 LEFT CLICK on Track Instruments. A window similar to the one below will appear. In Revoice Pro check that the Monitor swich (shown in red box below) is enabled as shown. You should now be able to start playing audio from Revoice Pro through the Nuendo system and Revoice Pro will also follow Nuendo's playback. NOTE: In Nuendo make sure that the Release Driver when Application is in Background option is not checked. 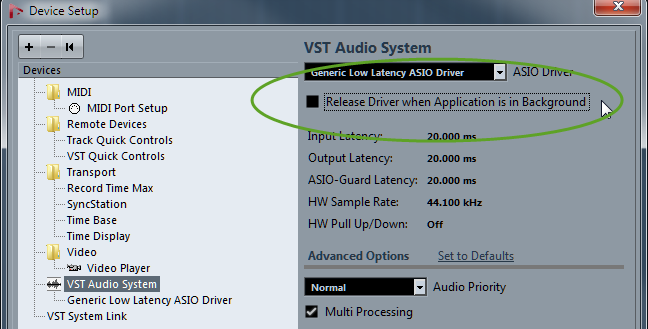 If this option is checked when you try and start playing from Revoice Pro the operation will fail because Nuendo is in the background. If you want to stop Revoice Pro from playing audio when you are playing audio in Nuendo you can click the Monitor switch to OFF. 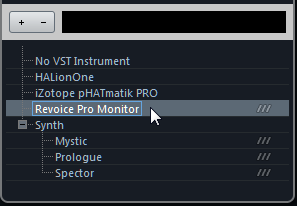 Alternatively you can mute the Nuendo track which has the Revoice Pro monitor plug-in, but this will not stop Revoice Pro from following the Nuendo timecode.